Place the crabs in the freezer until they go to sleep, approximately 15 to 20 minutes. This is the most humane method. Heat water in a good-sized wok and bring to the boil. Place a bamboo or metal steamer on top. Meanwhile, mix ginger, soy sauce, sesame oil and rice wine together in a small bowl. Remove the crabs from the freezer and crack the claws. Apply the mixture to the crab and allow it to soak in. 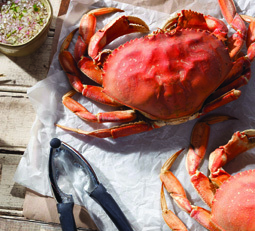 Place the crab in the steamer for 15 to 20 minutes – longer if the crabs are large. Don’t pack the steamer too tightly or the crabs won’t cook thoroughly. Serve hot or cold and season with salt.